Now that sounds unbearably pompous or over pious. But in fact it it is the name that the early Fathers of the Christian (yes there were also early Desert mothers too) church gave to their meditation or prayer life. The most well known was Anthony the Great, who moved to the desert in 270–271 and became known as both the father and founder of desert monasticism. The desert monastic communities that grew out of the informal gathering of hermit monks became the model for Christian Monasticism. The eastern monastic tradition at Mount Athos and the western Rule of St Benedict both were strongly influenced by the traditions that began in the desert. All of the monastic revivals of the Middle Ages looked to the desert for inspiration and guidance. 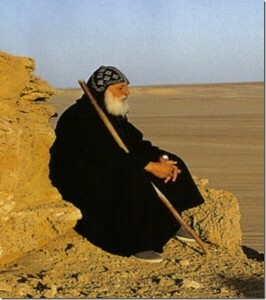 Much of Eastern Christian spirituality, including the Hesychast movement, had its roots in the practices of the Desert Fathers. Even religious renewals such as the German evangelicals and Pietists in Pennsylvania, the Devotio Moderna movement, and the Methodist Revival in England are seen by modern scholars as being influenced by the Desert Fathers. What was the attraction and how did such a spirituality survive so long and be seen as a valuable source by so many religious movements and bodies? Well put simply the early fathers learned to sit in silence and create a space in the heart for the Holy Spirit, or God or whatever you believe in, to find a home in. When I used to commute from Kinston upon Thames to Waterloo and back each day on crowded and often smelly commuter trains I was able to use this simple technique to shut out the noise and rattle and crush and just begin to exist quietly in the eternal now of the spirit. The Buddhists also do similar inner space creation. The way to empty the mind of the million and one thoughts that shout for our attention is to have a simple word or phrase we can silently murmur and use as a shield from the world. I must be one of the worlds most impatient people yet I found after a few days I could alight from my train in a calm and tranquil state usually, not always but very often. Co-workers in the mornings noticed and the people I lived with certainly did too. I was calmer less argumentative and much nicer to be around. Even now when my religious affiliation( as opposed to belief) is virtual non exist ant I still practice the awareness of the divine (or whatever). For such a small effort the result brings such great benefit. There are a few books and I know of some classes, but frankly if you can read and have patience to try, that is all you need. What word of phrase do I use? Well I took mine from the latin mass of Maundy Thursday because I liked the Taize hymn of the same name. Ubi Caritas…or in it’s full name Ubi caritas et amor, Deus ibi est. But any phrase that is attractive and spirit centred works just as well. Come Holy Spirit, Jesus Love, I know a Quaker Lady who uses the words ‘Bright Crystal’. What works works. I hope that anyone who feels anxious or uncertain or wants to reach out to the Divine might consider this ancient yet modern method. I’ll just close by giving the translation of that hymn as I think is is so beautiful.